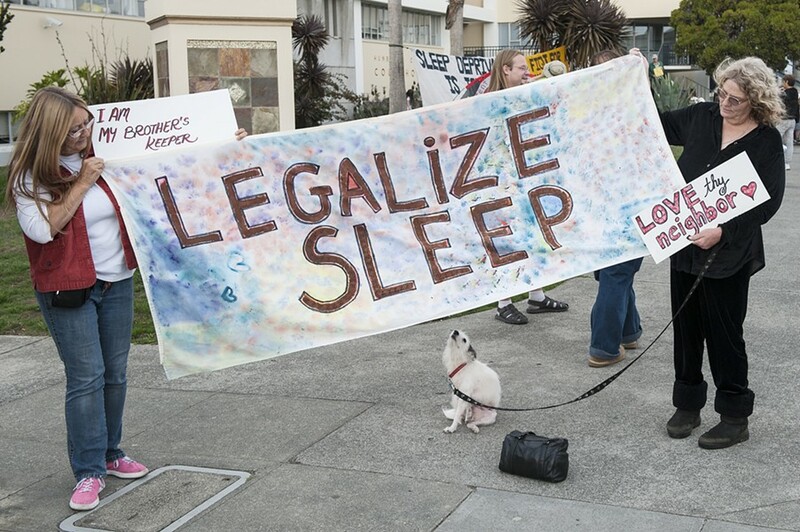 Carla Ritter, left, and Carlene "CC" Schultz, both of Fieldbrook, hold a banner supporting the decriminalization of sleeping in public. 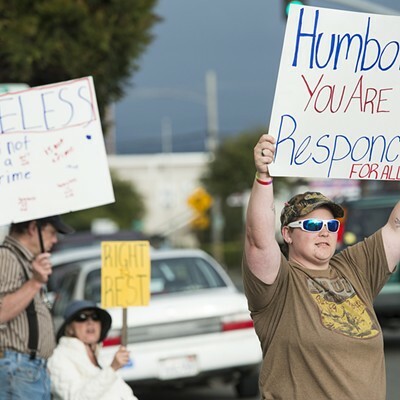 Schultz says she spent a year houseless in Humboldt County before getting a home. She said she had also been a "street mom" for eight to 10 years helping kids on the street and others when she had an RV. 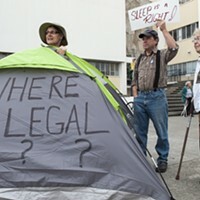 If you drove by the Humboldt County Courthouse on Saturday and had flashbacks of Occupy, it's understandable. 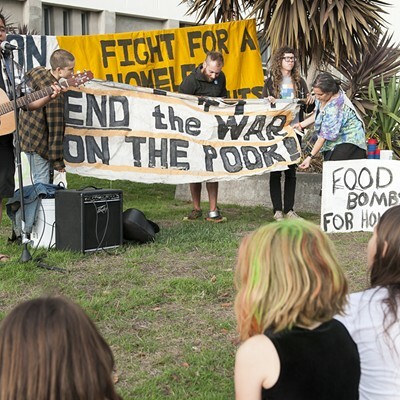 A few dozen people turned out Saturday for World Homeless Day, an international day of demonstration aimed at highlighting the needs of those living without homes, with some protesters pitching tents and hammocks to help make their point. 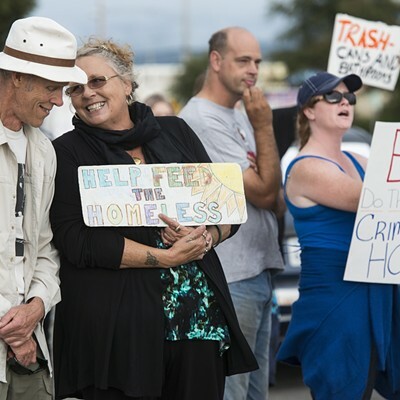 In a press release announcing the demonstration, local activist Janelle Egger said the event was about raising awareness and urging the community to find a better answer to dealing with homeless people and their impacts than law enforcement. 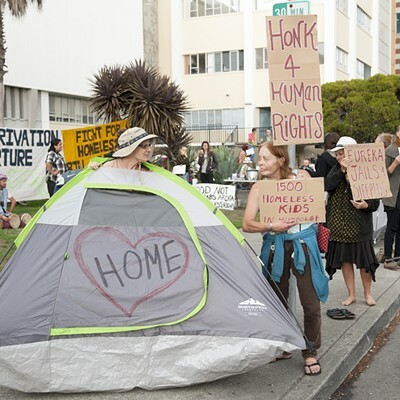 Egger's email notes that Eureka is awaiting a report on the potential implementation of a "housing first" approach, which would prioritize finding permanent or semi-permanent housing for the city's 700 or so homeless people. But Egger cautioned that "with winter approaching, we may need to settle temporarily for a 'legal first' approach." 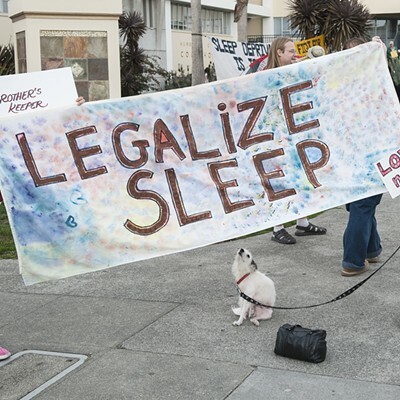 In the email, Egger also quoted from a recent U.S. Department of Justice legal brief that's been widely interpreted as saying that ordinances outlawing sleeping in public are unconstitutional. 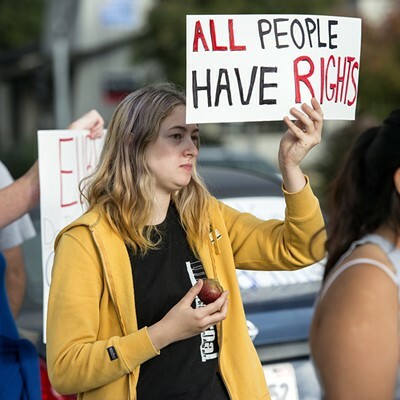 "It should be uncontroversial that punishing conduct that is a universal and unavoidable consequence of being human violates the Eighth Amendment. 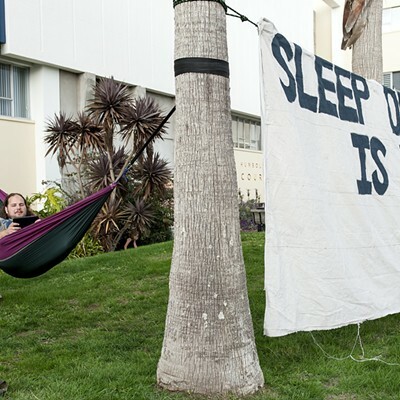 ... Sleeping is a life-sustaining activity, ie., it must occur at some time in some place. 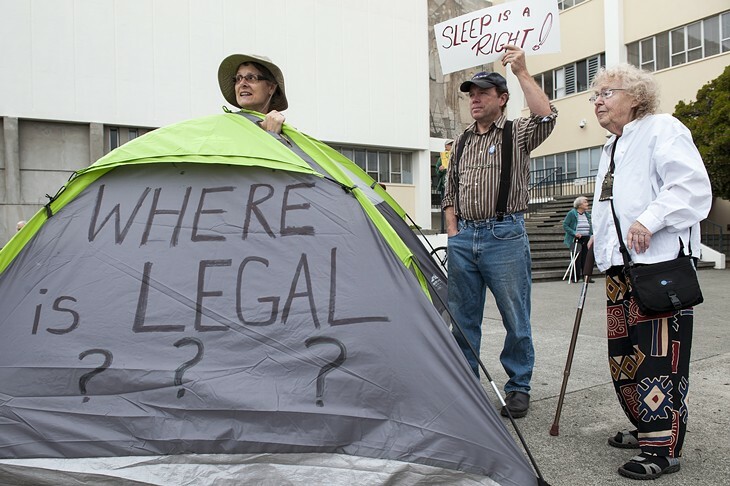 If a person literally has nowhere else to go, then enforcement of the anti-camping ordinance against that person criminalizes her for being homeless." 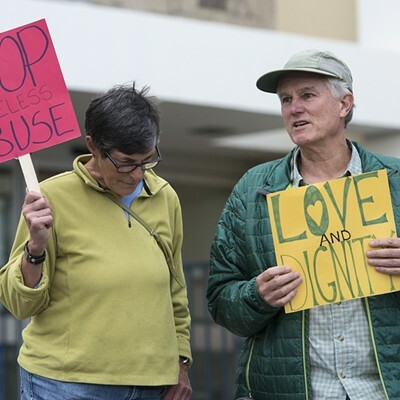 Local photographer Mark McKenna stopped by the courthouse Saturday and shared the following photos.